I continue fixing up the wp_nav_menu and the rest of my style.css code from my previous tutorial Creating a WordPress Theme. I’ve received numerous requests to walk you all through the process of creating custom menus using WordPress 3.0’s wp_nav_menu. So, here I’ll describe everything you need to know. It is actually very easy to create a horizontal wp nav menu. I’m going to ignore some of the options for the wp_nav_menu on purpose just so that you are not confused. If you want you can simply copy a paste the code below and everything will work in fact. If you want to watch me create the php code needed to create the wp_nav_menu in a horizontal format check out Creating a WordPress Theme, and then watch the following video. Otherwise skip past the video to the code below. To use WordPress’s wp_nav_menu just paste the following code where ever you want it to show up in your theme. 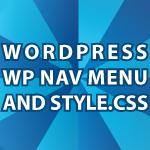 The following code is used to style your wp_nav_menu. You should put it in your style.css file or in a separate css file that is used just for your menu? I’ll provide comments that explains what the code below does. If I don’t comment, that means I think you don’t need to worry about changing that CSS code. That’s it!!! Now your WordPress wp_nav_menu theme works! Here is the rest of the code from the video being style.css and home.css. Leave questions and comments below. How do I open an external link in wp_nav_menu? Click on Menu under Appearance in your left side bar. Then put your external link in where it says custom links. I open the link in a new page or tab (_blank). I can only open the same page (_self). That’s the way it works by default. I’m not sure if you can change that without editing the core files in wordpress? It’s better to not edit the core because the work you do will be overwritten when wordpress updates. On /wp-admin/nav-menus.php , click on the link for Screen Options in the top right of your screen. Hidden away in the dropdown there, below the usual Show on screen checkboxes, is another line of Show advanced menu properties checkboxes. I´m searching for a way to insert an image into my menu. so left should be the logo (as a link to the homepage) followed by all my menu items…. i foudn some tips and tricks but they did´t word out for me. do you have a solution? it´s about a horizontal navigation in the header. thank you in advance for your reply! Hi Sir Derek, how not to include the sub menu in footer menu? Just only the main menu display. Thanks. Thanks for writing this tutorial. I pasted the code in the right places and edited the style for coloring. Sadly, I still cannot get this to work in my header. I’ve gotten the menu to show up as an unordered list vertically in black text (absolutely no styling). Tried pasting the code into the footer, same result although this time it was centered. Any help you can provide would be great. Thanks in advance. Especially for providing the stylesheet info. Great tutorials, do you have custom page tutorial Derek? Can you give me the links. Thanks. How to Layout a Website & Create a WordPress Theme : This is my current tutorial. I think it’s simple but the theme is much more complicated than the first theme I made. Thanks so much for your tutorials and help. This web site totally rocks!! I have made a new wordpress site totally from scratch which is AWESOME! I need some help with my menu settings. How do I fix the menu settings for dropdown items that span more than one line. For instance, under the menu option “Events”, I have something titled “Designing Your Bedroom For Your Attitude”. The “Your Attitude” is on a second line and the words run into the line above it. So the lines are overlapping and you can not read them. Do you know what I mean? and can you help me? I found that place in the CSS code but I don’t really want to make the dropdown bar super long (like 400px). It’s already 300px which is pretty big. Is there a way that I can let it span over 2 lines but have the text appear as readable instead of overlapping? Thank you so much. This is exactly what I needed!! Great tutorial! I’m trying to get a horizontal submenu spanning across dropped down from one of my menu items. I have set up the submenu on the wordpress menus screen but can only get vertical. I have also changed the code a little to make my menu items a set height and width with the text placed centrally within blocks of colour. It works perfectly (i think), my menu has spanned horizontally with vertical submenus appearing below the main menu, but is there a way to have the submenu expand horizontally? Anything is possible. How you would create it is based on if you always want the submenus to be displayed horizontally? It is all a matter of positioning with css. If you wanted them to sometimes be horizontal and other times vertical you’d have to program that difference in. For this particular site i am designing I would always like the sub menu to display horizontally. With each list item set next to the other. Do you know where in the above code I would specify this?? I’m back with another menu question. This code works perfectly for my header menu. Now I would like to set up another menu and apply it to my footer area. Let’s say I call it Bottom Menu. How would I set that up? I have created a menu named main-menu. When my page displays it picks up your burgundy background colour but the menu is still displaying in typlical word press fashion with no formatting and the pages listed one under the other with dot points. What do you think I have missed? I have used all your cross browser code, I added the js file and the ie.css file to my theme, I updated the style sheet and I included the script reference in the header as per your example in your html index page. My page html code is different than yours. The quotes din’t seem to work. Is there any other way I can show you the code? I’ve one question – how to make to display submenu in horizontal position? I am trying your horizontal code and in most respects it works but as I hover them try to click on a sub menu the sub item disappears before I can click on it. Why do the sub items disappear when I start to move my mouse in their direction? Did it. Worked like a charm. Thank you. Like you said a tool for use later. Hi I got the same problem, I tried the crossbrowser menu, but there it doen’t says how to work with – wp_nav_menu. I’m a bit stuck on this now. Thank you the tutorial. I don’t know much about CSS, so I was hoping for a copy and paste type solution. I bought a theme, and I’m trying to tweak it. The menu that came with the theme shows all of the pages, regardless of whether it is a subpage. I copied in your code, and it is pulling the correct text, but only just showing it as text (see chaterschoolcorp.org). Is there something I’m missing? That theme seems to be blocking you from creating edits. That stinks! I’m sure you can go in and disable them from blocking you, but I’m not sure how. Another great tutorial as always. I Have a question regarding the hover function. Is it possible to have the hover menue show only when clocked upon? I’ve tried to change li:hover to li:active but with no success. I think this would be great since a lot of people uses IPads and IPhones now days. My project is looking good. Thanks. Now I’m trying to center the menu. I’ve tried ‘margin-left:auto;margin-right:auto at several levels (#navigation, ul.dropdown, ul.dropdown li) and haven’t had any luck. Any suggestions? First thanks for your tutorials on WordPress – they are definitely the best out there! Now, here’s my issue – when using your CSS etc for the Drop Down menus on a WP 3.5 site I’m putting together, I just couldn’t get the menus that I’d created in the WP admin to take on ANY of the CSS. I’d put your php menu array snippet in my header and added the get_menu thingy in the functions.php. I’d thrashed the variable names until I was blue in the face, but every time I looked at the source that WP was generating, all the list items were classed as ‘menu’, not ‘dropdown’ so I had to change the CSS to reflect this and bingo, it all works. Any ideas why this might’ve happened? I was using the HTML5-Reset blank theme to build from. I posted php snippet in my header as suggested, corrected the curly braces with straight ones. Added some css and realised it wasn’t working so I looked at the source code for the page and there was no container surrounding it called navigation. It’s surrounded with a div called ‘dropdown’ though. I deleted the line “‘container_id’ => ‘navigation’,” and saved and reloaded and sure enough the same result so that line doesn’t seem to be creating a container called navigation. This is no problem because I can do this manually without using wordpress but I thought I would tell you of my woes xD By the way what container should I wrap it in? a div or perhaps a nav container, what am I saying I will just do what I always do and mess around. Thanks for the tutorial though.